Wine milkshake? Red Robin’s got one. 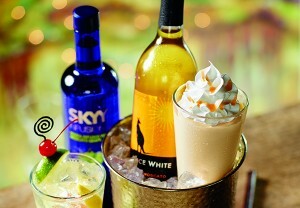 Red Robin, yes, the chain that brought you the a burger called “Burnin Love,” now has a wine milkshake on the menu. The Mango Moscato Wine Shake includes vanilla soft serve ice cream, Skyy Vodka (Moscato flavored, I’ll have to look into that for another post), Moscato by Alice White (the cheap wine you can buy at the grocery store for $5 that has a kangaroo on the label) and mango puree. Red Robin introduced beer milkshakes in the past, including one featuring Blue Moon. I’ve had boozy milkshakes before at the Satellite Room in Washington, D.C. which were delicious, but those included shakes mixed with Bulleit bourbon and Tanqueray dry gin. Wine and ice cream I have yet to try, but I’m going to keep an open mind on this one. You know what they say, don’t knock it until you try it. I have to say though that I’ve been antsy to try the Guinness milkshake at Slater’s 50/50. H/T to Chicago Tribune for spreading the news about the family dining restaurant’s newest drink concoction.